The MAPK/Erk signaling cascade is activated by a wide variety of receptors involved in growth and differentiation including receptor tyrosine kinases (RTKs), integrins, and ion channels. GPCRs (G-Protein Coupled Receptors) activate the MAPK cascade using a different set of adaptors. Adaptors (Shc, GRB2, Crk, etc.) link the receptor to a guanine nucleotide exchange factor (GEF), i.e. SOS and C3G. The GEF proteins transduce the signal to small GTP binding proteins (Ras, Rap1). The GTP binding protein activates the core unit of the cascade composed of a MAPKKK (Raf), a MAPKK (MEK1/2), and MAPK (Erk). Activated Erk can regulate targets in the cytosol and also translocate to the nucleus where it phosphorylates a variety of transcription factors regulating gene expression. Activation of Erk (extracellular signal regulated kinase) requires the phosphorylation of Thr202 and Tyr204 amino acid residues. NIH/3T3 cell pellets (Figure A) treated with either TPA (to induce Erk phosphorylation) or U0126 (to inhibit Erk phosphorylation) (Figure B) paraffin embedded ovarian cancer sections. 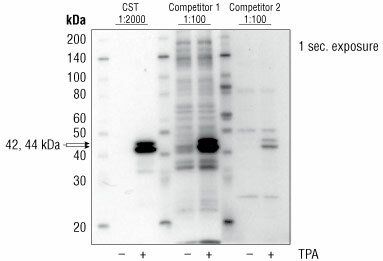 CST #4370 antibody shows strong cell staining in the TPA treated cells but not in the U0126 treated cells as expected. At a 1:400 dilution, Company 1 antibody shows weak staining in TPA induced cells. At a lower dilution/higher concentration, Company 1 antibody shows strong non-specific staining in the U0126 treated cells. CST #4370 stains ovarian cancer tissues more strongly than the company 1 antibody at the same dilution. When used at a lower dilution/higher concentration, company 1 antibody showed weaker yet comparable staining to CST #4370. 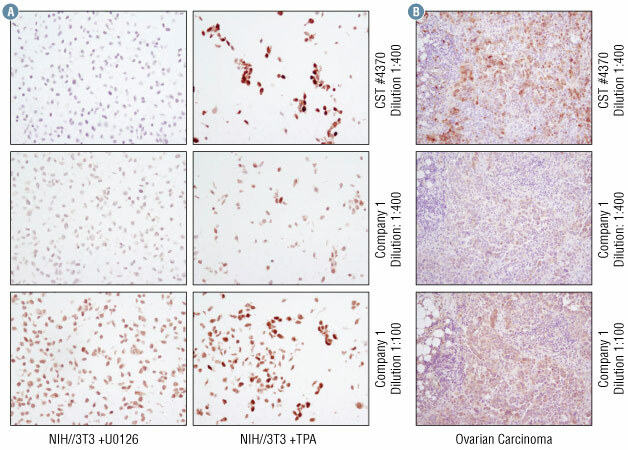 Given the background staining by Company 1 antibody in the NIH/3T3 cell pellets treated with U0126, the ovarian cancer tissue staining specificity is questionable. 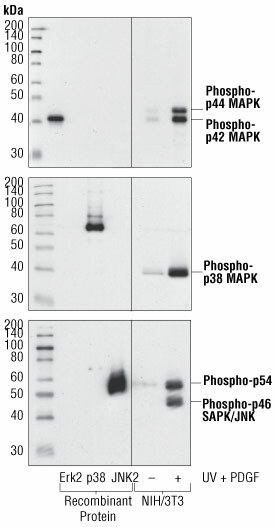 Western blot analysis of purified MAPK phospho-proteins or extracts from NIH/3T3 cells treated with UV light and PDGF, using Phospho-p44/42 MAPK (Erk1/2) (Thr202/Tyr204) (197G2) Rabbit mAb #4377 (upper), Phospho-p38 MAPK (Thr180/Tyr182) (3D7) Rabbit mAb #9215 (middle), and Phospho-SAPK/JNK (Thr183/Tyr185) (98F2) Rabbit mAb #4671 (lower). Function: Activation of Erk (extracellular signal regulated kinase) requires the phosphorylation of Thr202 and Tyr204 amino acid residues. Samples: Jurkat cells were treated with TPA, a phorbol ester that activates PKC to induce Erk phosphorylation. CST Phospho-p44/42 MAPK (Erk1/2) (Thr202/Tyr204) (D13.14.4E) XP® Rabbit mAb #4370 recognizes the expected double bands at 44 and 42 kDa that correspond to Erk1 and Erk2 respectively. Company 1 phospho-p44/42 MAPK (Erk1/2) (Thr202/Tyr204) mouse monoclonal antibody recognizes the expected double band at 44 and 42 kDa but also shows high background and non-specific bands. Company 2 phospho-p44/42 MAPK (Erk1/2) (Thr202/Tyr204) rabbit polyclonal antibody weakly detects the expected double band at 44 and 42 kDa. TPA strongly induces Erk phosphorylation, therefore the weak signal suggests low antibody binding.